Tina Makereti is appearing at the Auckland Writers Festival in ‘Pieces of History’ along with Kerry Donovan Brown, Lawrence Hill and Fiona Kidman (chaired by Carole Beu). Sunday May 18th, 4 to 4.50 pm, Limelight Room, Aotea Centre. This is a free event. I don’t usually write about novels on Poetry Shelf, but I have just finished one that I am so full of, I want to share that fullness. And I am full in a good way. 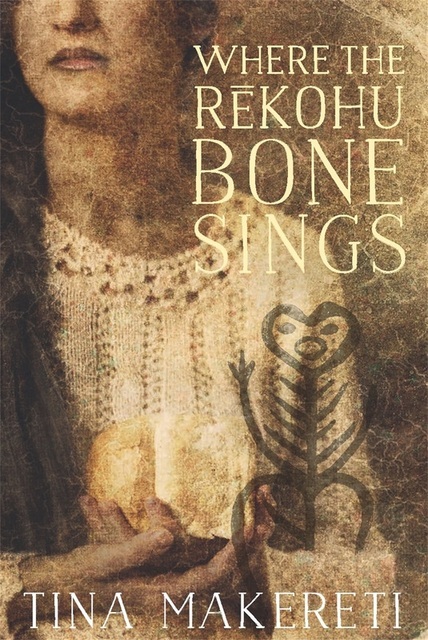 Tina Makereti’s novel, Where the Rēkohu Bone Sings (Random House, 2014), is a novel that emerges from diligent research and thought, yet also draws upon the panoramic experience as a mother, daughter, partner, lover. More than anything, the novel shows how fiction can represent the molecular dance of being human—the strengths, the weakness, the biases—in a way that refreshes your view of things. The narrative structure resembles three entwined ropes: There is the love story of Mere and Iraia that stretches back to the legacy of their ancestors (he the descendant of slave, she the descendant of Moriori). There is the story of twins, Lula and Bigs who against all odds are different colours (one brown and one white) despite a shared mother and father. They discover a secret that explodes the identity story upon which they were raised. Finally there is the speaking but disembodied voice that seeps into the nooks and crannies of both narratives, and that speaks with a gamut of emotional investment and a growing revelation of belonging. At the heart of all this, are the Moriori people—the novel leads you from Queen Charlotte Sounds to the Chatham Islands/Rēkohu with various other side trips. Tina’s extraordinary book embraces all manner of loves and strengths but as it faces the challenging and complex effects and behaviours of racism (amongst other issues), it shows too the power of story to delve deep. To take risks. To refract and reflect. We are raised on stories—from the ones our parents and forbears pass down to those that circulate at a wider cultural or societal level. Yet there is the agony of the gap, such as was the case with the Moriori, where the vital stories were mute, smudged, missing. Yet the questions raised were the crucial gift for me. How to represent history (fictional or otherwise) in the face of all its clashing and volatile versions? How to live when your identity is ‘braided ropes’? How to move forward when these rope strands all bear the strain of unspeakable episodes (crimes against humanity, racism, intolerance, ignorance)? How to look back in order to move forward? How to forge and reforge personal and cultural identities? How to love and how to grieve? How to forgive? How to remember and how to forget? These are some of the questions that Tina has embedded in her narrative. Not in a didactic or pedantic way but in the bone marrow of her characters. This is what lifts the novel beyond the joy of fiction (and it most definitely provides this) to a renewed engagement with what it means to love and live in the place where you have laid your roots—Aotearoa/New Zealand. Tina has written with such warmth, compassion, daring, empathy, insight and intellectual keenness on issues that matter so very much without ever losing sight of the ability of stories to sustain us, I urge you to read the novel. The academic side of Tina’s PhD in Creative writing is available through Victoria University. This entry was posted in Uncategorized and tagged NZ Book Review, Tine Makeriti on May 12, 2014 by Paula Green. I for one am glad you veered off the poetry path for this, Paula. Sounds like a beautiful and compelling must-read. I am glad to have your introduction to Tina’s new novel. I’m only sorry I’ll miss that panel at the Auckland Readers and Writers Festival — these questions of history and identity and how to weave it all together in a meaningful way (individually, universally) are constantly at work in my own psychology. Thanks for this.